The production of virulence factors in Staphylococcus aureus is tightly controlled by a complex web of interacting regulators. EsxA is one of the virulence factors that are excreted by the specialized, type VII-like Ess secretion system of S. aureus. The esxA gene is part of the σB-dependent SpoVG subregulon. However, the mode of action of SpoVG and its impact on other global regulators acting on esxA transcription is as yet unknown. We demonstrate that the transcription of esxA is controlled by a regulatory cascade involving downstream σB-dependent regulatory elements, including the staphylococcal accessory regulator SarA, the ArlRS two-component system and SpoVG. The esxA gene, preceding the ess gene cluster, was shown to form a monocistronic transcript that is driven by a σA promoter, whereas a putative σB promoter identified upstream of the σA promoter was shown to be inactive. Transcription of esxA was strongly upregulated upon either sarA or sigB inactivation, but decreased in agr, arlR and spoVG single mutants, suggesting that agr, ArlR and SpoVG are able to increase esxA transcription and relieve the repressing effect of the σB-controlled SarA on esxA. SpoVG is a σB-dependent element that fine-tunes the expression of esxA by counteracting the σB-induced repressing activity of the transcriptional regulator SarA and activates esxA transcription. The production of virulence factors in Staphylococcus aureus is coordinated by a network of two-component systems, global regulators and transcription factors, allowing optimal adaptation of the pathogen to a changing environment and stress conditions encountered during the various stages of infection. 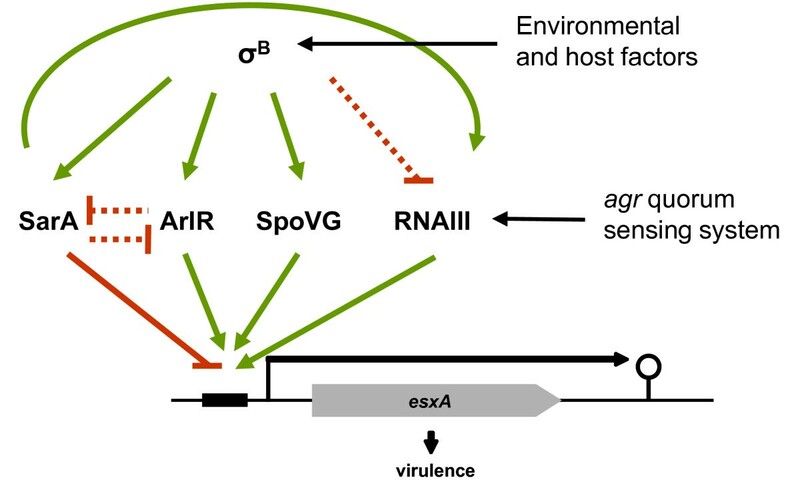 A central regulatory element of virulence factor production in S. aureus is the accessory gene regulator agr, a two-component quorum sensor regulating gene expression in a growth-dependent manner. The main effector molecule of the agr operon is the regulatory RNAIII , which is responsible essentially for the upregulation of secreted proteins in the post-exponential phase. 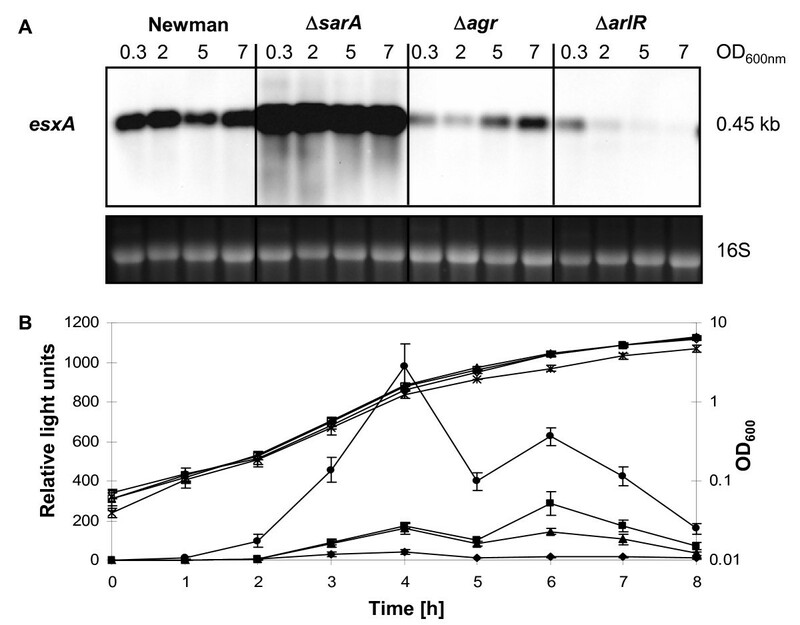 RNAIII transcription is enhanced by the staphylococcal accessory regulator SarA  and reduced by the alternative sigma factor σB in strain Newman [3, 4]. SarA is a winged helix transcription factor influencing many virulence genes [5, 6]. The transcription of sarA in turn is directly activated by the alternative sigma factor σB , which controls over 250 genes including virulence factors and secondary regulators in a direct or indirect way . Indirectly σB-controlled genes lack a σB consensus promoter sequence, and are thought to be controlled by secondary, σB-dependent regulatory elements. The yabJ-spoVG operon, with SpoVG as effector molecule, is besides SarA one of the directly σB -dependent secondary regulators . SpoVG contributes to methicillin and glycopeptide resistance, stimulates capsule synthesis, and was recently shown to regulate a small σB-subregulon comprising mainly excreted virulence factors including the highly upregulated virulence factor EsxA [8–10]. Secretion of virulence factors is facilitated by several translocation systems in S. aureus , the major Sec pathway, the accessory Sec2 system , the twin-arginine translocation pathway , and the type VII-like specialized ESX secretion pathway (Ess) . The Ess system comprises a cluster of at least nine genes: esxAB, essABC, esaABC and esaD [14, 15] and secretes proteins with a size of approximately 100 amino acids containing a helical structure and a conserved Trp-Xaa-Gly (WXG) motif . Three proteins were so far shown to be exported by the staphylococcal Ess system, two WXG100 family proteins, EsxA and EsxB, and the non-WXG100 substrate EsaC [14, 17]. All three proteins act as pathogenicity factors in a murine model of staphylococcal blood-borne dissemination and abscess formation [14, 17]. The actual role of EsxA, EsxB and EsaC remains unclear. Structural analysis of EsxA suggests a role as transport module or chaperone to assist export of proteins by the Ess secretion pathway rather than being an effector protein itself . The esxA gene seems to be under complex control. Besides being upregulated by SpoVG , esxA was found to be upregulated by ArlR . The two-component system ArlRS [19, 20] itself is activated in an indirect way by σB in strain Newman [3, 9], adding a further level of complexity in the regulation of esxA. 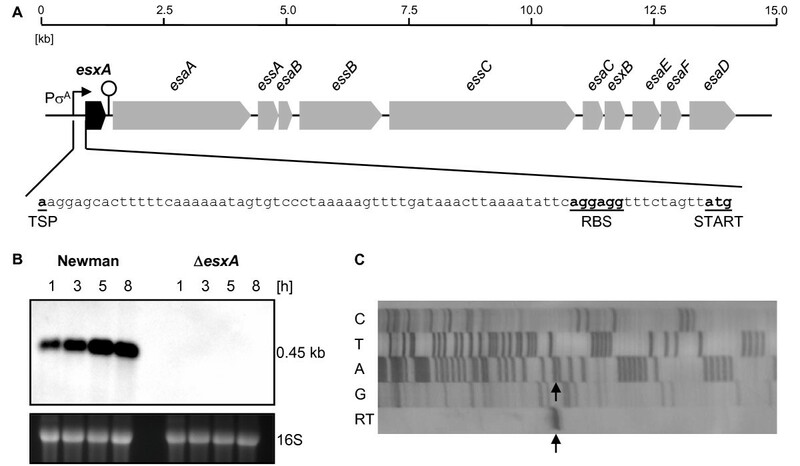 This study analyses the transcriptional control of esxA by σB and the σB-dependent regulatory elements SarA, ArlR, RNAIII and SpoVG. The bacterial strains and plasmids are listed in Table 1. Bacteria were grown on Luria Bertani (LB) agar (Becton Dickinson, Franklin Lakes, NJ, USA) or in LB broth with shaking (180 rpm) at 37°C in a flask to medium ratio 5:1. Where required, media were supplemented with 100 μg ml-1 ampicillin, 20 μg ml-1 chloramphenicol, 10 μg ml-1 erythromycin, or 10 μg ml-1 tetracycline. a Abbreviations are as follows: Apr, ampicillin resistant; Cmr, chloramphenicol resistant; Emr, erythromycin resistant; Mcr, methicillin resistant; Tcr, tetracycline resistant; Ter, teicoplanin resistant. General molecular biology techniques were performed according to standard protocols [32, 33]. Sequencing was done using the Big Dye Terminator Cycle Sequencing Ready Reaction Kit and an ABI Prism 310 genetic analyzer (Applied Biosystems, Foster City, CA, USA). Sequences were analyzed with the Lasergene software package (DNASTAR, Inc., Madison, WI, USA). The markerless deletion of esxA (nwmn_0219) in strains Newman, BB1002 and NM143 was constructed using the counter selection system of pKOR1 as described by Bae et al. , using primer pairs oBS43/oBS44 and oBS45/oBS46 (Table 2) to amplify sequences framing esxA. Correct deletion of esxA in BS304, BS307 and BS308, respectively, was confirmed by sequencing and Southern blot analysis, and the absence of major rearrangements by pulsed-field gel electrophoresis . a Restriction sites are underlined. Capital letters show the att sites. The Newman sarA mutant BS309 and the Newman agr mutant BS310 were constructed by transducing the ermB-tagged sarA mutation of NM520 , and the ermB-tagged agr mutation of NM521  respectively, into Newman and selecting for erythromycin resistance. Correct inactivation of the genes was confirmed by sequencing and Southern blot analysis. For the construction of promoter-lacZ reporter fusions, DNA fragments covering the yabJ or esxA promoter of strain Newman were amplified using primer pairs yab-prom-bam-f/yab-prom-xho-r and Pnwmn0219F/Pnwmn0219R-xho (Table 2), respectively. The PCR products were digested with BamHI and XhoI and ligated into promoter probe plasmid pSB40N  upstream of the lacZα reporter gene to obtain pyabJp and pesxAp. For the construction of pesxAp-luc + , the esxA promoter region of strain Newman was amplified by PCR using primer pair Pnwmn0219F-hind/Pnwmn0219R (Table 1). The resulting PCR product was HindIII/NcoI-digested and cloned into pSP-luc + upstream of the luciferase reporter gene luc + . The esxA promoter-luc + fusion of the resulting plasmid was amplified using the primers Pnwnm0219F-hind/pSP-Luc XhoI, digested with HindIII and XhoI and cloned into the E. coli-S. aureus shuttle plasmid pBus1 to obtain plasmid pesxA-luc + . Plasmids pesxApΔσA-luc + and pesxApΔσB-luc + were made by deleting the σA and σB promoter sequences, respectively, from pesxAp-luc + . The corresponding DNA fragments were amplified with primer pairs oBS49/oBS53 and oBS51/oBS54 (Table 2) from pesxAp-luc + and religated. All plasmids constructs were confirmed by sequence analyses. Overnight cultures were diluted 1:100 into LB, grown for 2 h, and then used to inoculate 100 ml of pre-warmed LB to an optical density of 600 nm [OD600 nm] of 0.05. Cell samples were taken at the time points indicated, centrifuged at 12,000 × g and 4°C for 2 min, the pellets were snap-frozen in liquid nitrogen. Total RNA was isolated according to Cheung et al. . RNA samples (8 μg) were separated in a 1.5% agarose gel containing 20 mM guanidine thiocyanate in 1 × Tris-borate-EDTA buffer . RNA transfer and detection were performed as previously described [41, 42]. Digoxigenin (DIG) labelled probes were amplified using the PCR DIG Probe synthesis kit (Roche, Basel, Switzerland). The primer pairs used for amplification of the esxA, spoVG, asp23, arlR, sarA and RNAIII probes are listed in Table 2. RNA was extracted from LR15 cultures that were grown to OD600 nm 2.0, as described by Cheung et al. . Primer extension reactions were performed using 20 μg of total RNA and 3 pmol of the 5'-biotin-labelled primers pe_esxA_1 and pe_esxA_2 (Table 2) using Superscript II reverse transcriptase (Invitrogen, Carlsbad, CA, USA), according to the manufacturers instructions. Sequencing reactions were performed using the Thermo Sequenase Cycle Sequencing Kit (USB Corporation, Cleveland, OH, USA) and template DNA amplified with primers Pnmmn0219F and esxA_term-r from Newman genomic DNA. The Biotin Chromogenic Detection Kit (Fermentas, Burlington, Ontario, Canada) was used for biotin detection. Testing of the interaction of S. aureus promoters with E. coli RNA polymerase containing S. aureus σB was done essentially as described earlier . The promoter-reporter plasmids pasp23p (asp23 promoter); pyabJp (yabJ promoter); pesxap (esxA promoter); and pSTM07 (capA promoter); or the empty plasmid pSB40N, were transformed into E. coli DH5α containing either pAC7-sigB or pAC7. The color production of the clones was analyzed on LBACX-ARA plates (LB agar containing 5 mg ml-1 lactose; 100 μg ml-1 ampicillin; 40 μg ml-1 chloramphenicol; 20 μg ml-1 X-Gal (5-bromo-4-chloro3-indolyl-D-galactopyranoside) and 2 μg ml-1 arabinose) . Luciferase activity was measured as described earlier  using the luciferase assay substrate and a Turner Designs TD-20/20 luminometer (Promega). The proteolytic activity of S. aureus strains was determined on skim milk (Becton Dickinson, 75 g l-1) agar plates as clear zones surrounding colonies. To compare the hemolytic activity, S. aureus strains were grown on sheep blood agar and the clear halos around the colonies were analyzed. Plates containing an antibiotic gradient were prepared and inoculated by swabbing a 0.5 McFarland cell suspension in physiological NaCl solution along the gradient as described before . Growth was read after 24 h and 48 h of incubation at 35°C. Teicoplanin and oxacillin minimal inhibitory concentrations (MICs) were determined using Etests according to the manufacturer's instructions (AB-Biodisk, Solna, Sweden). The 294 bp esxA gene (nwmn_0219, GenBank accession no. NC_009641), coding for a small secreted protein involved in staphylococcal virulence, is the first of at least nine genes of the ess gene cluster encoding the type VII-like ESX-1 secretion pathway (Ess) in S. aureus (Figure 1A) [14, 15]. Although esxA seems to belong transcriptionally to the ess gene cluster , transcriptional profiling produced one single esxA-specific transcript with a size of about 0.45 kb appearing in early growth phase after 1 h and increasing slightly within time (Figure 1B). No esxA-specific signals were detected in the corresponding ΔesxA mutant BS304, confirming the esxA deletion. The deletion of esxA had no polar effects on the expression of the downstream ess genes, nor on the divergently transcribed gene directly upstream of esxA, predicted to be involved in staphyloxanthin synthesis [37, 44, 45] (data not shown). Our results suggest that esxA is located on a monocistronic transcript and is not co-transcribed with the remaining genes of the ess gene cluster. In a microarray of strain Newman, esxA transcription was found to be upregulated by the σB-controlled yabJ-spoVG operon . Searching the nucleotide sequence upstream of the esxA ORF for potential σA (TTGACA-16/18-TATAAT) [46, 47] and σB (GTTTAA-12/15-GGGTAT)  consensus promoter sequences and for a ribosomal binding site (AGGAGG) , we identified 80 bp upstream of esxA a putative σA promoter (TatACA-17-TATtAT), and 155 bp upstream of esxA a potential σB promoter (GgTTAA-12-GGGTAT). A proposed ribosomal binding site (RBS, AGGAGG) was located 9 bp upstream of the esxA start codon (Figure 1A). Fourteen bp downstream of the esxA stop codon we identified a putative Rho independent terminator consisting of a 13 bp inverted repeat with a minimal free energy ΔG of -17 kcal/mol as calculated by mfold . esxA in S. aureus. A. Schematic representation of the ess locus of S. aureus Newman (GenBank accession no. NC_009641). ORF notations correspond to those used by Anderson et al. . The σA promoter, transcriptional start point (TSP) and ribosomal binding site (RBS) as well as the start codon of esxA are indicated. B. Northern blot of esxA of strain Newman and the isogenic ΔesxA mutant (BS304) during growth. The ethidium bromide-stained 16S rRNA pattern is shown as an indication of RNA loading. C. Primer extension analysis of esxA. Lanes C, T, A and G show the dideoxy-terminator sequencing ladder and lane RT the reverse transcription product obtained using primer pe_esxA_2. The TSP is marked by an arrow. The same TSP was identified using primer pe_esxA_1 (data not shown). Primer extension analysis located the transcriptional start point (TSP) of esxA 74 bp upstream of the start codon of esxA (Figure 1A-C). It was preceded by the predicted -10 and -35 σA promoter elements, and further up by the σB promoter. To verify and compare the function of the putative σA and σB promoter sequences, we cloned the esxA promoter region upstream of the firefly luciferase reporter gene and analyzed the luciferase activity of this construct, pesxAp-luc + , as well as of constructs containing either a deletion of the σA or σB promoter (pesxApΔσA-luc + , pesxApΔσB-luc + ). Whereas the relative luciferase activities of pesxAp-luc + and pesxApΔσB-luc + after 3 h of growth were comparable, pesxApΔσA-luc + showed almost no activity, suggesting that esxA possesses a σA-dependent promoter (Figure 2). We could rule out a direct involvement of σB in the control of the esxA promoter, furthermore, by testing the esxA upstream region in the heterologous two-plasmid system that was established to identify σB-dependent S. aureus promoters . The upstream region of esxA was cloned into the reporter plasmid pSB40N resulting in plasmid pesxAp which then was introduced into E. coli DH5α containing either pAC7-sigB, expressing the S. aureus sigB gene from an inducible promoter, or the empty plasmid pAC7. If the S. aureus σB - E. coli RNA polymerase core enzyme hybrid recognized the esxA promoter, dark blue colonies would be expected on the indicator LBACX-ARA agar  in combination with pAC7-sigB, as with the σB-dependent promoters of asp23 or yabJ (positive controls); if not, uncolored colonies would be expected, as with the σB-independent promoter of capA or the empty pSB40N (negative controls). In contrast, transformants containing the empty pAC7 vector should produce uncolored colonies. However, both combinations, pesxAp with either pAC7 or pAC7-sigB, developed an identical only light blue color in E. coli DH5α, indicating that the esxA promoter was recognized weakly by an E. coli RNA polymerase, but that the observed transcriptional activity was independent from σB (data not shown). Overall, the results of the esxA promoter and terminator sequence analyses supported a monocistronic transcription of esxA from a σA-dependent promoter. σ A -dependence of the esxA promoter. Luciferase activities of plasmids pesxAp-luc+ (wt), pesxApΔσA-luc + (ΔσA) and pesxApΔσB-luc+ (ΔσB) in S. aureus Newman. The strains were grown in LB broth at 37°C and 180 rpm for 3 h. Data shown are the means ± SD of four independent experiments. Statistical significances between the different strains were assessed with a paired, two-tailed Student's t-test (* p < 0.01). To differentiate between the effect of σB and of the σB-controlled yabJ-spoVG on the transcriptional control of esxA, we followed the luciferase activity of the esxA promoter-reporter fusion in pesxAp-luc + during the growth cycle in parental strain Newman, the corresponding ΔrsbUVW-sigB mutant (IK184), and in the ΔyabJ-spoVG mutant (SM148). The luciferase activity increased in the parent Newman in a growth phase dependent manner from the exponential towards the stationary phase and declined thereafter (Figure 3A). The course of luciferase activity in the ΔyabJ-spoVG mutant SM148 and in the ΔrsbUVW-sigB mutant IK184 was comparable but the overall activity was reduced by a factor of two in SM148, whereas it was two up to four times higher in IK184. These effects were also mirrored by the intensity of the esxA specific transcripts (Figure 3B). Since esxA transcription in strain MS64 , a mutant with a stop in sigB inactivating σB, was indistinguishable from that in IK184, we could assign the upregulation of esxA transcription to the loss of σB and exclude any contributions of rsbUVW (data not shown). Effect of σ B and σ B -controlled SpoVG on esxA expression. A. Transcriptional activity of the esxA promoter in strain Newman (squares), SM148 (triangles), and IK184 (diamonds). Growth was followed by measuring the optical density at 600 nm [OD600] (open signs), and the activity of the esxA promoter was determined by the luciferase activity of pesxAp-luc + (filled signs). B. Northern blot analysis of esxA transcription in Newman, the ΔyabJ-spoVG mutant (SM148) and the ΔrsbUVW-sigB mutant (IK184) over growth. C. Northern blot showing esxA transcription in Newman, the ΔyabJ-spoVG mutant (SM148) and the ΔrsbUVW-sigB mutant (IK184) complemented with pBus1, pyabJ, pspoVG or pyabJspoVG after 5 h of growth. Ethidium bromide-stained 16S rRNA patterns are shown as an indication of RNA loading. 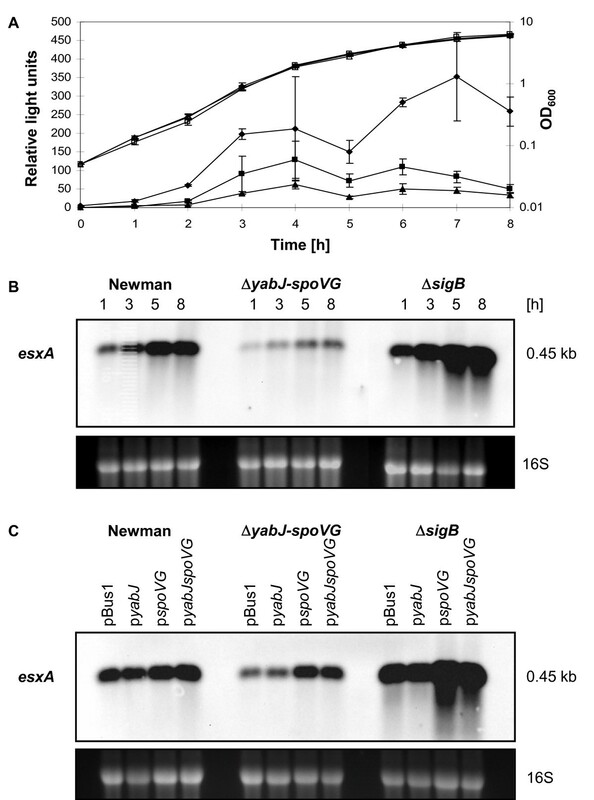 To determine if either yabJ or spoVG inactivation was responsible for the reduction of esxA transcription, we complemented Newman, SM148 and IK184 in trans with a series of plasmids expressing constitutively either yabJ (pyabJ), spoVG (pspoVG), or yabJ-spoVG (pyabJspoVG), circumventing the requirement of σB to transcribe the yabJ-spoVG operon. Northern blot analysis revealed that the constructs containing spoVG or yabJ-spoVG, but not the one carrying yabJ, did restore the esxA transcription to wild type level in SM148 (Figure 3C). In IK184, showing stronger esxA transcription signals than the wild type, the esxA transcription was even further enhanced by the complementation with pspoVG or pyabJspoVG, confirming that SpoVG, but not YabJ, had a positive effect on esxA expression in presence and absence of σB. However, the fact that esxA transcription was strongly induced in IK184 lacking not only σB, but consequently also the σB-dependent SpoVG, suggested that esxA transcription may be activated by SpoVG but repressed by other σB-dependent factors. As σB and SpoVG had opposite effects on esxA expression, we searched for further σB-dependent regulators that might be involved in esxA control, namely the two major regulators of S. aureus, the agr system with its effector molecule RNAIII; and the transcriptional regulator SarA. A further candidate was ArlR, the response regulator of the ArlRS two-component system, reported to be activated by σB in strain Newman, and promoting together with SpoVG capsule formation . The transcript intensity of esxA in Newman compared to that in its isogenic ΔsarA (LR15), Δagr (KS186) and ΔarlR (SM99) mutants during growth, revealed a strong upregulation of esxA in LR15, a downregulation in KS186 and an even stronger attenuation in SM99 (Figure 4A), suggesting that SarA acts as repressor, and RNAIII and ArlR as activators of esxA transcription. This was confirmed by the level of luciferase activity of pesxAp-luc + during growth, which was highly increased in the ΔsarA mutant (BS309), and lower in the Δagr (BS310) and almost absent in ΔarlR (SM99) mutants compared to the wild type Newman (Figure 4B). Interestingly, as in capsule synthesis, SpoVG and ArlR acted as elements enhancing the esxA expression . Effect of SarA, agr and ArlR on esxA expression. A. Northern blot of esxA in Newman, and the ΔsarA (LR15), Δagr (KS186) and ΔarlR (SM99) mutants over growth. The ethidium bromide-stained 16S rRNA pattern is shown as an indication of RNA loading. B. Transcriptional activity of the esxA promoter in strain Newman (squares), ΔsarA mutant BS309 (stars/dots), Δagr mutant BS310 (triangles), and ΔarlR mutant SM99 (diamonds). Growth was followed by measuring the OD600 (open signs), and the activity of the esxA promoter-reporter construct was determined by the luciferase activity of pesxAp-luc + (filled signs). The strains BS309 and BS310 are isogenic to LR15 and KS186, respectively, except for an exchanged resistance marker in the inactivated loci allowing the selection and maintenance of pesxAp-luc + . EsxA itself had no influence on the signal intensity or activity of any of the above regulatory genes, neither on asp23, as an indicator of σB activity [37, 44, 50], nor on spoVG, arlR, sarA or RNAIII, when comparing their expression in strain Newman and in the ΔesxA mutant BS304 during the growth cycle (Additional file 1). We could also rule out any autoregulatory effects of EsxA on its own transcription, since luciferase activity patterns of pesxAp-luc + were congruent over the entire growth cycle in Newman and BS304 (data not shown). An overview of the regulatory network influencing esxA transcription is given in Figure 5, including also the mutual interactions of the different regulators: σB activity was found to be comparable in all strains tested, excluding secondary effects on esxA transcription due to an altered σB activity (Additional file 2). We confirmed the previously reported positive influence of σB on arlRS and yabJspoVG transcription [7, 9], as well as on sarA transcription [3, 7]. In contrast, we could not detect any major changes in RNAIII transcript intensity in σB mutants, although some studies suggest that σB activity is reducing the RNAIII level [3, 4] (Additional file 2). Transcriptional regulation of esxA by global regulators of virulence in strain Newman. Major upregulation is represented by green arrows, downregulation by red bars. Dashed lines indicate minor influences. Further, minor changes in transcription were observed in the ΔsarA mutant where RNAIII was downregulated and arlR transcripts were slightly upregulated, and in the ΔarlR mutant where sarA transcription was increased (Additional file 2: Figure S2A). However, these dependencies could not explain the changes in esxA transcription in the corresponding mutants. The successful deletion of esxA reported here, and the superimposable growth rates of wild type and esxA mutant in complex LB medium, confirmed that EsxA was not essential for growth in vitro (data not shown). The growth defects observed in sigB and arlR mutants, the former affecting late  and the latter reducing early growth stages , can therefore also not depend on altered EsxA expression. Although σB and SpoVG are known to influence extracellular proteolytic activities , and σB is known to repress hemolytic activity in S. aureus [4, 7, 37], EsxA did neither affect proteolytic nor hemolytic activities in BS304 (data not shown). As the activity of the sigma factor σB and the σB-controlled SpoVG positively influences methicillin and glycopeptide resistance in methicillin resistant S. aureus (MRSA) and in glycopeptide intermediate resistant S. aureus (GISA) [8, 51–55], we deleted esxA in MRSA strain BB1002  and GISA strain NM143 . However, resistance levels of the ΔesxA mutants BS307 and BS308 to oxacillin and teicoplanin, respectively, were identical to those of the parent strains, when measured by Etest (Table 3), as well as by antibiotic gradient plates, which allow the detection of very small differences in resistance (data not shown). 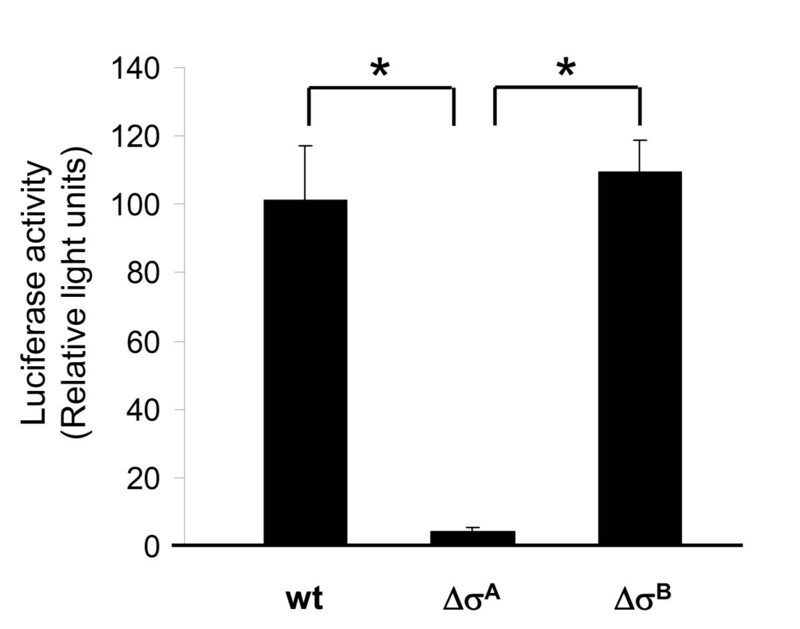 These results suggest that EsxA, which enhances abscess formation in mice and is thought to act either as transport chaperone or adaptor protein , primarily plays a role as extracellular virulence factor in pathogenesis. Our data suggest that the repression of esxA by σB is due the σB-induced transcription of sarA, leading to a strong and dominating SarA-mediated repression of esxA. The activation of esxA transcription, on the other hand, is stimulated by the agr quorum sensing system, the response regulator ArlR, and the effector protein SpoVG; whereby arlR is controlled indirectly, and spoVG directly by σB. Thereby the activating effect of ArlR seems to be more profound than the effect of SpoVG and agr. Moreover, virulence gene regulation in S. aureus is very complex and additional factors might contribute to the regulation of esxA transcription. The mode of function of SpoVG, named after the stage V sporulation protein G in Bacillus subtilis , and SpoVG homologues in other bacterial species is yet unknown, nor have any SpoVG interacting partners been reported. SpoVG does not affect σB activity as seen from the expression of asp23, which is a measure of σB activity in S. aureus. SpoVG does also not interfere with the transcription of sarA, arlRS nor agr in strain Newman. By which mechanisms SpoVG counteracts the postulated SarA-mediated repression of esxA remains open. The affinity of SarA binding to DNA can be enhanced by phosphorylation , but a postulated interaction of SpoVG with SarA or other proteins has yet to be investigated. Interestingly, the same stimulating effect by ArlRS and SpoVG is seen in S. aureus capsule synthesis . We therefore can not rule out that SpoVG and ArlR may interact or have some common target. SpoVG by itself seems also to enhance transcription of esxA when artificially overexpressed in a sigB mutant. The absence of predicted DNA binding motifs in SpoVG may not fully exclude its interaction with nucleic acids or with factors involved in transcription. In conclusion, we have presented here SpoVG, an interesting new player in the regulatory cascade modulating S. aureus virulence factors. This study was carried out with financial support from the Forschungskredit of the University of Zurich to BS, and from the Swiss National Science Foundation grant 31-117707 to BBB. BS carried out most of the experiments, participated in the design of the study and drafted the manuscript. DAB participated in the transcriptional analysis. BBB conceived the study, and participated in its design and coordination, and helped to draft the manuscript. All authors read and approved the final manuscript.